HAVE you ever thought of growing the ananas in the living room, that too the ornamental variety? Some innovative gardening enthusiasts have done it. They are the ones who keep the interest in horticulture alive with new experiments. They are, in the true sense, the conservationists of biodiversity. The accompanying picture shows an ornamental ananas growing at the Sector 2 residence of Justice S.S.Kang, a former Governor of Kerala. Ananas, the word is derived from ‘nanas', the South American name for the pineapple. Not many people know that it is also a kind of terrestrial bromeliads. It is not at all a fussy plant. It grows exactly like the bromeliads. It has whorled leaves, in a rosette formation. 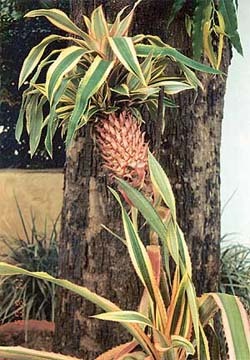 The ornamental ananas has leaves that are a metre long. It is strap-like with a whitish-golden margin and pink flushes. The leaf margin is highly spiky. The plant has, therefore, to be kept at a place where its barbed foliage does not tear the clothes or prick the hands and eyes. It has especially to be kept out of the reach of children. You need patience to rear such plants. It grows too slowly in the beginning; so much so that in the first few months you may not be able to decide whether it is growing. As it grows to a height of about a metre in the pot, it needs a bigger pot with good balance. The plant can easily be grown in a verandah which gets sunshine for at least two to three hours. Generally, the plant can be grown from the rosset that is removed from the fruit along with a centimetre or so of the flesh, which is then anchored securely on top of a water jar and it strikes roots. You can use moist compost in place of water. The plant can also be propagated from the suckers that appear near the base. The tufted top of the fruit also has such small platelets growing at the base. The fruit appears on a long stalk emerging from the whorl of leaves. As the fruit grows in size it becomes heavy and needs some support to remain erect. The fruit in case of the ornamental ananas is simply spectacular. It seems as if an independent unit of the fruit and the plant has been kept on top of the mother plant. The fruit is pink in colour and has a tuft at the top. You needn't be scared of cleaning its spiky leaves for fear of getting pricked. Simply wash these with a jet of water.